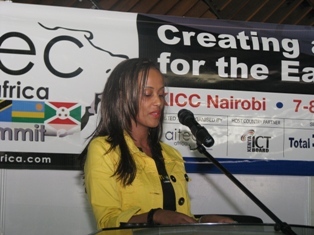 Ms. Sophia Bekele, Executive Director of DotConnectAfrica, spoke of a way forward for the ".Africa" project during the opening panel discussions and subseqent launch of the East Africa "dotafrica" campaign. It is always very nice to be back in Nairobi and East Africa, neighbor to my home country, Ethiopia. I want to thank the organizers of AITEC for giving us a platform to speak. Believe it or not, I did not chose the title of our topic, the organizers did “dotafrca and ICT enabled Economy, we only have to rise up to it. I am happy therefore, that DCA have chosen this event to announce the launch of the East Africa dotafrica campaign and beginning of our efforts right herein Nairobi. Our campaign theme mirrors the theme used for nations reborn, like that of Kenya last week and the USA with President Obama. Therefore, our campaign is also called the “yes” campaign and we have a booth here at AITEC that exhibits our products and innovations so far and how we plan to have people say “yes” to our campaign. So please visit our booth of DOTCONNECTAFRICA on the main floor. Before getting into the subject of my presentation, allow me to sage-way a bit and say few words which I think could address some anticipated questions by some during our panel discussions in few minutes. Well as many of you know Ramadan ends tomorrow (or thereabouts) with the Eid festival about start. So Eid Mubarak to all of our Muslim cousins. Of course the Prophet Mohammed, peace be upon him, stood for his beliefs and of course so did Jesus – both were not believed, and even called liars but now have followers in the millions even billions. Well, who knows with a billion people in Africa maybe we can get a billion followers as well. So I am no liar when I say we will lead the Dotafrica initiative to the promised land. Not because we took it from anyone, or not because we got there first, or we are anti competition , or like those who think they have an institutional right to the name Africa or .africa but because we are the best contenders, and because we have a clear vision and mission to get it done. Let me share with you my experience during the World cup event in South Africa, aside from watching great games; I was invited by the African Leadership Retreat in Capetown and JoBurg, to present .africa in a “re-branding exercise”. One of the key note speakers was Dr. Dele Olojede, Pulitzer Prize Winner, Nigerian National. He spoke from experience, an exceptional man, when he addressed us saying, dear friends - there is no such thing as rebranding Africa , except, that of with "good governance". Well, I rest my case. And in the contest of a renewal for our African leadership, I can assure you the first name we will be reserving under .africa is going to be goodgovernance.africa. Actually talking about South Africa and the World Cup – they did us so proud. It was a real privilege to see how well “we Africans” can do. In fact it really was a roller coaster, wasn’t it. I certainly do not want to remind you of a certain “hand of god 2.0” but Ghana really put up a wonderful effort. And by the way here’s a bit of trivia, Botswana, South Africa , Kenya and Ghana are amongst the top four countries to live in Africa. So things are certainly on the way up and a great time to be doing something like .Africa. So I promise you, we will have followers on facebook and followers on twitter and many social networks that will be very, very many soon. We have a billion population opportunity and we may well hit millions. We are happy with what . Eu has done and so .Asia and now “it is time for .Africa”, which is also our campaign theme along with the “yes” campaign, which we are launching at this AITEC event. Myself, I am guilty as charged for pushing to get things done, and of course “.Africa”. It is a personal satisfaction and important for me to use the influence of power that I have around me to GET THINGS DONE, to pull people together, apply my own experience and keep pushing. Yes also, I have, as an individual, I have pushed “.africa” through every key African institutional agenda, or be on international platforms. Bill Gates was an individual and he changed the world and so did FaceBook and Steve Jobs, these are all individuals in their own rights. Individuals are the ones that make up a whole. But of course they all got backed up by a strong team. What matters is the principles we go by; and as a Rotarian I always reflect the “4-Way Test of Rotary” with all what I do as an individual “Is it the TRUTH? ; Is it FAIR to all concerned? ; Will it build GOOD WILL and BETTER FRIENDSHIPS? ; Will it be BENEFICIAL to all concerned?. And what we are doing at DCA is exactly that. This is beyond the individual. It’s a team effort! The truth can be manipulated to the views of the beneficiary, but the facts cannot be ignored. I was educated in a country that holds a long reputation for democracy – the United States of America, where the individual’s rights are respected along with the communal system. However politicians or political institutions have at instances sacrificed our individual rights over the altars of collecting votes for their next offices. Finally, Martin Luther King said, “the arc of the universe is long, but it bends towards justice”. Ladies & Gentleman, thank you for listening and God Bless Africa. Allow me to brief you on our activities on “.Africa”.